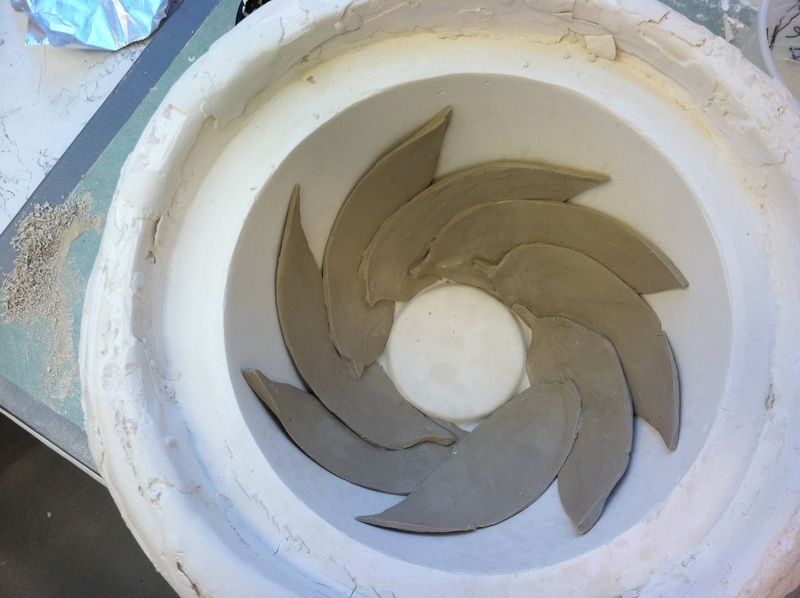 Here is the filament mold in process. This will be attached to the anthers to collectively make the stamen. 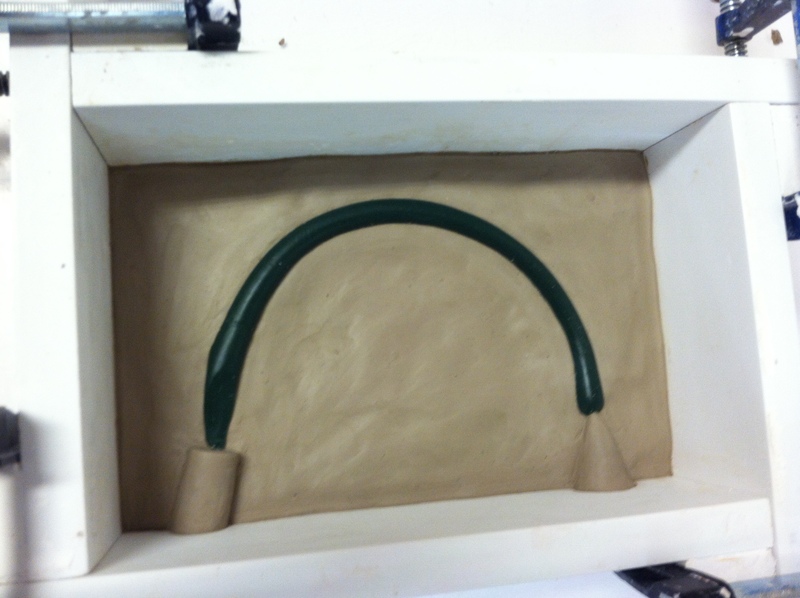 I used plasticine, oil clay that never dries (that’s the dark green piece). 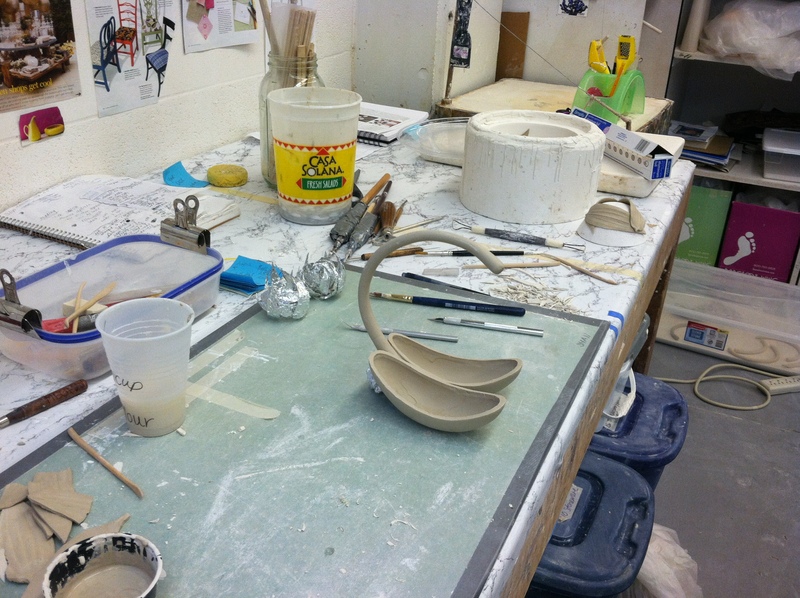 Stoneware or any other clay would dry out before I got a chance to make the mold. The plasticine gave me ample working time. 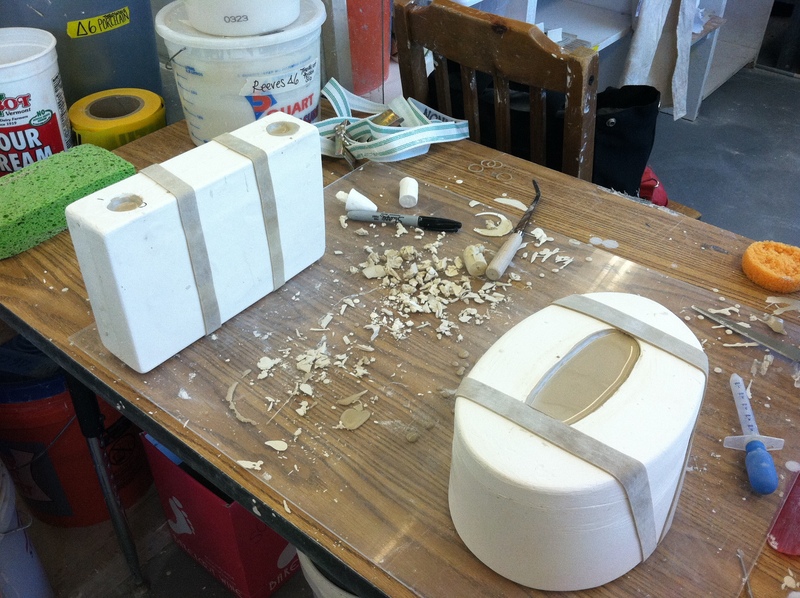 I made a two part mold with a plug and a reservoir to keep one side solid and allow for even fill and airflow. These are some lily leaves Rebecca gave to me. 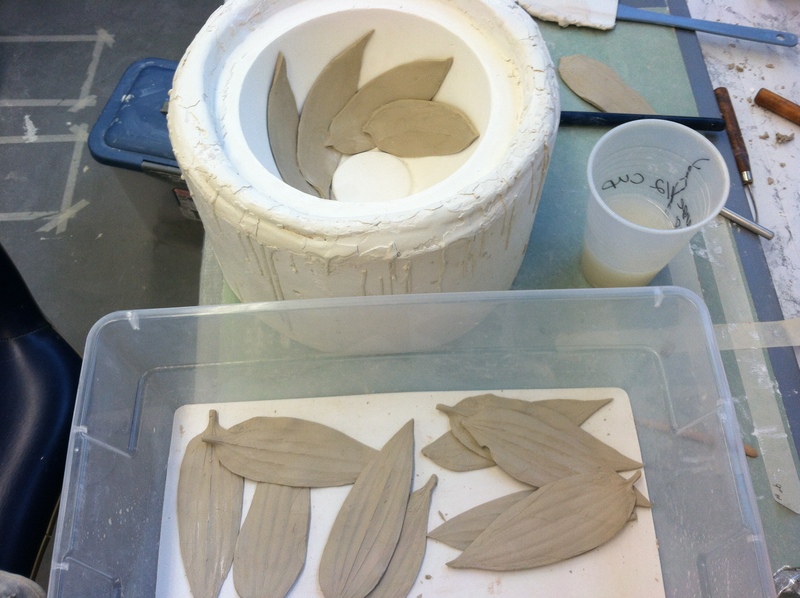 I pressed the leaves into plaster as it set and the imprint was left behind. 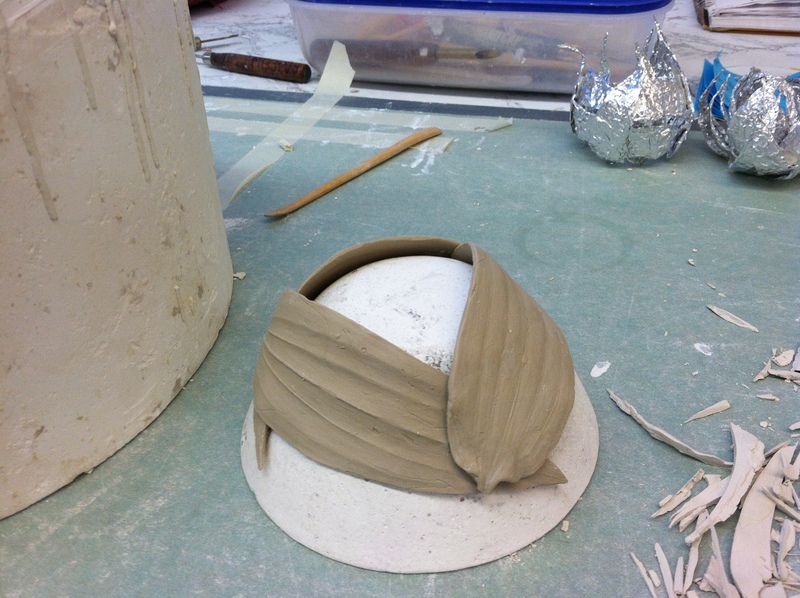 This was mostly for experimentation as I will use similar forms for my calyx basket. 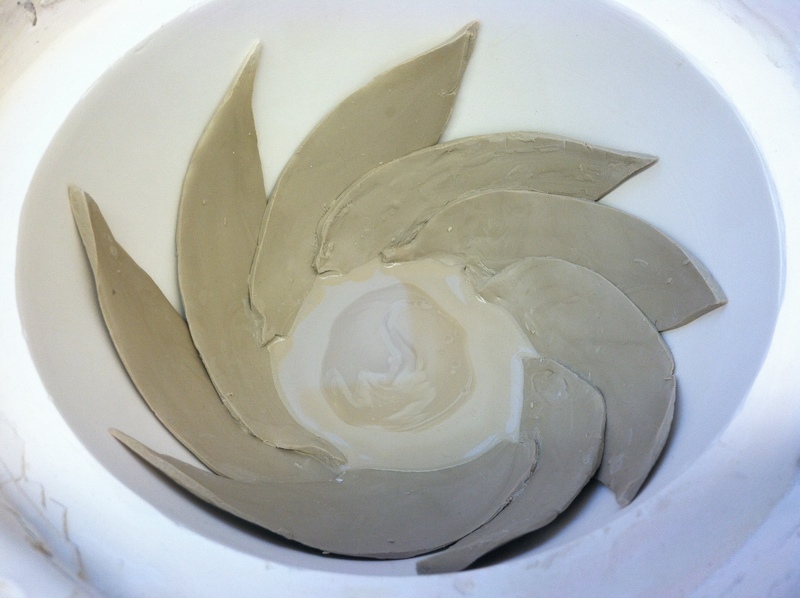 I started casting today… results below! 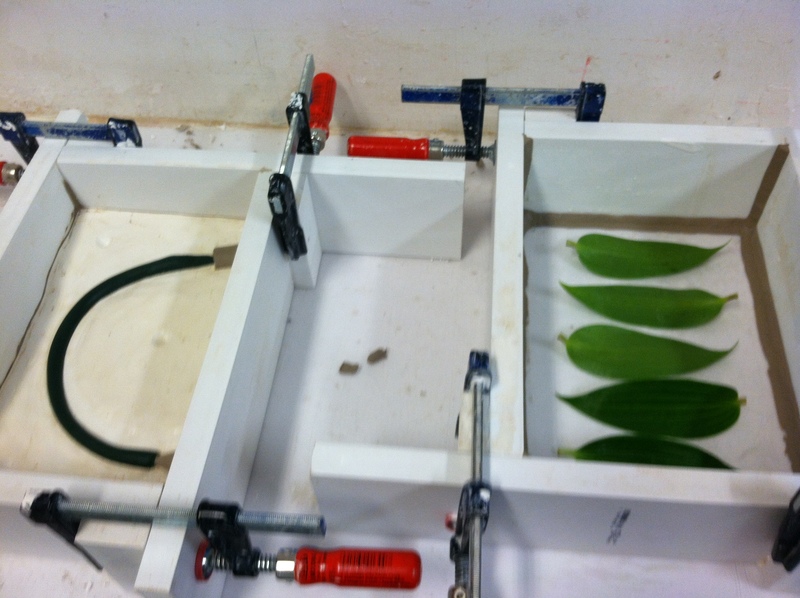 Here are the anther and filament molds working the same shift! 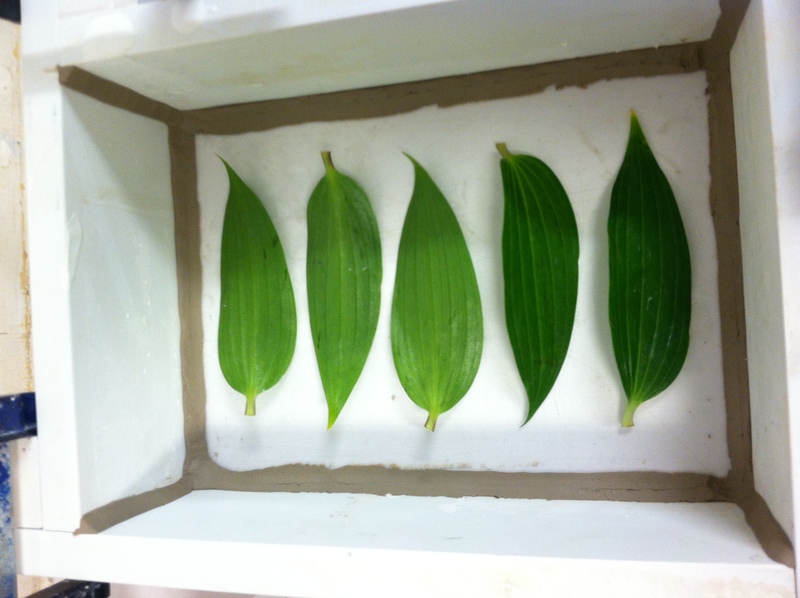 And, here are some casts after attaching. I tried two different slip recipes. 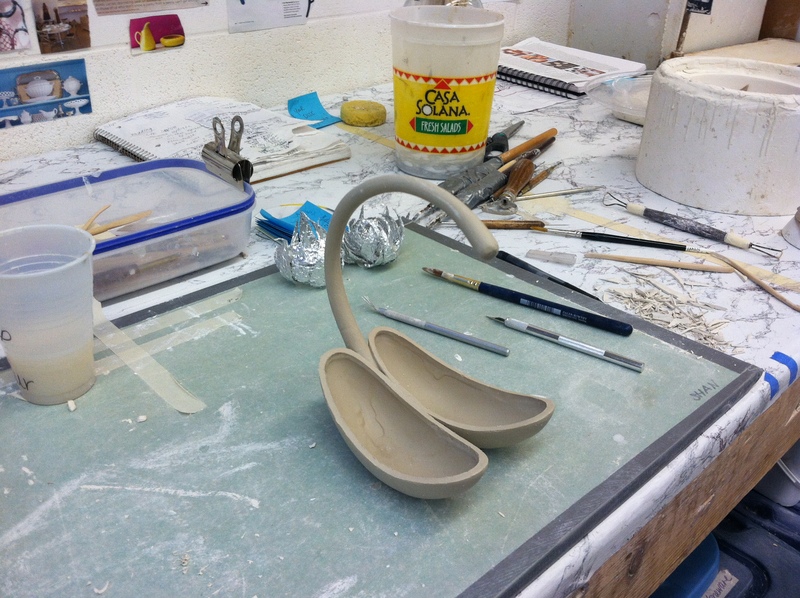 The one above is Reeves Porcelain made into a cone 6 slip. It dries very fast, settles in the bucket and is prone to slumping. However, it is very white and translucent, I will definitely use it for my pollen forms. I decided to work with Spleth made into a cone 6 as well, both recipes originally cone 10 from Val Cushing. The Spleth is much more cooperative, it can be easily manipulated and it tends to keep its shape. I have to devise a method of support for the filament so that it doesn’t slump in the firing, which could happen with either slip. I am going to try a couple of different options to see what works. Suggestions welcome!!!! 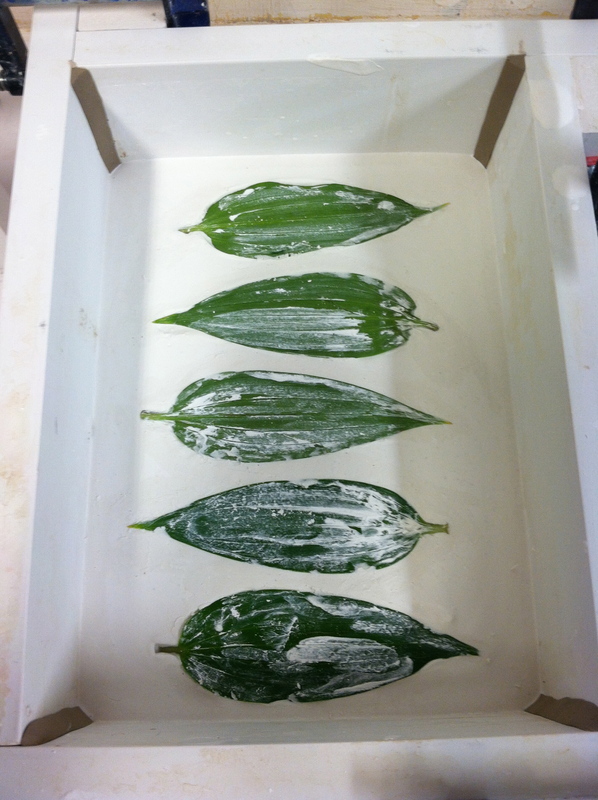 Here are the cast leaves in action! 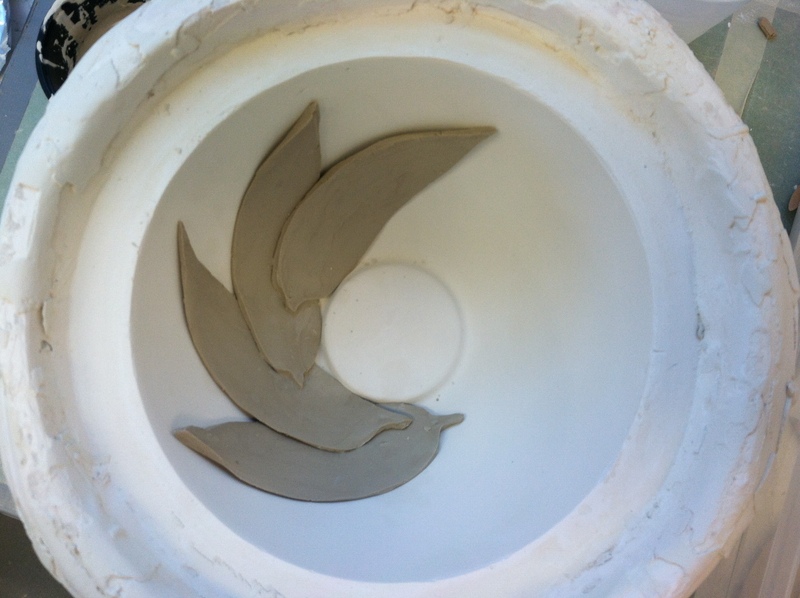 I am shaping them inside a bowl mold, and pouring slip in the bottom to form a flat base. This is basically what I want to do for my calyx object. 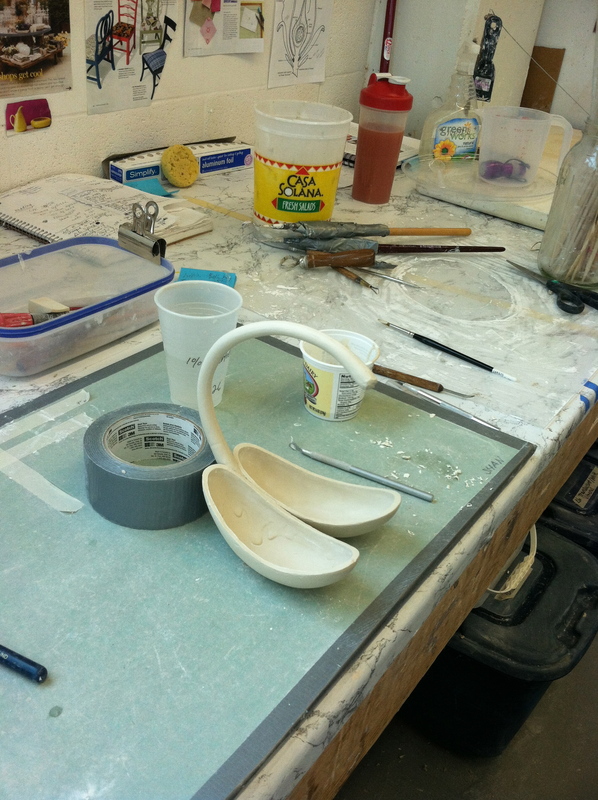 I am going to see how it comes out in the firing and if it works well then I can go ahead with my plan. Just for kicks… I had some left over. Lookin good, Shan! Glad to see that you got some use out of those leaves. 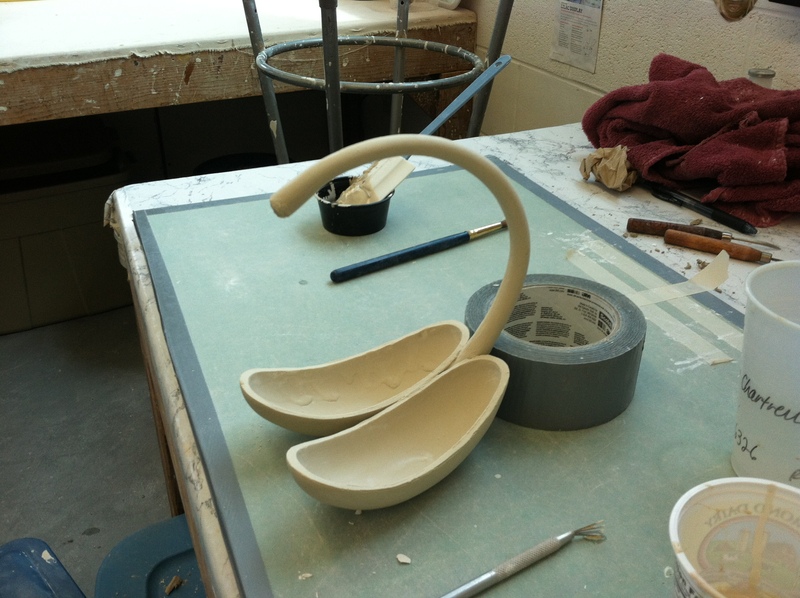 It’s fun to see the work develop at different stages.. excited to see further developments!